Grand Hyatt Bali in Indonesia is a romantic getaway located on a beautiful beach, surrounded by lakes, landscaped gardens and five lagoon and river pools. The resort offers a program for kids, an array of dining options, many fun activities, and luxuriously appointed rooms, suites and villas. The 24-villa Kriya Spa offers authentic Balinese massages and other healing treatments. You can relax and rejuvenated surrounded by tropical gardens. Kriya traslates to "ritual" in Sanskirt. The spa was inspired by an ancient Balinese water palace and incorporates ancient traditions. The resort has 5 restaurants and two bars, serving a variety of flavors. Work out at the fitness center, play squash and take aerobics classes. After a workout, relax in the steam and dry sauna, and cool off in the plunge pools. The resort offers daily activities for guests which range from free scuba demonstrations and bocce lessons to kite flying and tennis matches. You can also play a round of scenic golf at the Bali Golf & Country Club, 5 minutes from the hotel. If you are planning a family vacation to Bali, take advantage of the fun activities offered at the kids' club, open to kids between 3 and 13 years old. Relax by the pool and get massages at the spa while your kids participate in activities, including fish feeding, sports and games, Balinese arts and crafts. Guests are accommodated in low-rise Balinese style buildings. Choose from 648 rooms, suites and villas, most with private balconies or gardens. Honeymooners should book Grand Suite King which overlooks the Indian Ocean and has a separate sitting area, great for ordering room service and relaxing with a view. Grand King : The 49 square meter guestroom is furnished with one king bed, daybed and scenic balcony. A similar room with two Twin beds is also offered. Ocean View King: This is the room to book if you want a view of the ocean. It has a luxurious bath with separate shower, robe, slippers and a minibar. A similar Ocean View Twin is also available. Club King: When you stay in this room, you receive Grand Club privileges. Club Twin, Deluxe King, Deluxe Twin, Deluxe View Kind and Deluxe View Twin are also available. Enjoy views from the balcony. The hotel offers a diverse choice of suites, great for families who need more space, as well as couples on their romantic getaway. Grand Suite King: This spacious 98 square meter suite has a balcony and garden view. Families can reserve one or more connecting rooms for additional space. Grand Executive Suite King: The 141-sq-meter suite can accommodate 4 guests and is furnished with one king bed and a private balcony. Choose from Indian Ocean or tropical garden views. Grand Executive Suite Twin offers a similar layout. Club Executive Suite King: Enjoy Grand Club privileges when you stay in this luxury suite. A configuration with two Twin beds is also offered. Ambassador Suite : The 166- sq m suite is a great choice for couples, honeymooners and families who want plenty of space. Presidential Suite : At 239-sqm, this is the largest suite at the resort. Enjoy the luxurious terasso bath with separate shower, balcony kitchenette and a separate sitting area. The the ultimate in pampering and relaxation, book one of the Grand Villas which are set right on the beautiful sandy beach. Villa Belibis: This stunning 175-sq m beachfront villa enjoys Grand Club privileges. Villa Beratan: The 192-sq m villa can accommodate 6 guests and features opulent Balinese decor and a two-bedroom layout. Villa Tamblingan: At 407-sq m, this ultra-luxe villa can accommodate 8 guests. Relax in the jacuzzi with ocean views on your romantic getaway. 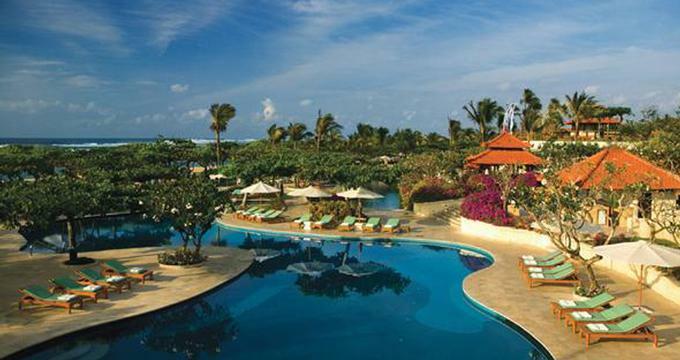 Choose from a diverse offering of restaurants, cafes, bars and lounges at the Grand Hyatt Bali. Pasar Senggol: Designed as a contemporary Balinese night market, Pasar Senggol offers authentic Indonesian and Balinese dishes in an open setting. You will be entertained by the live Balinese cultural performances while you dine. The restaurant serves dinner from 7:00pm to 10:30pm, while cultural performances start at 8:00pm. Salsa Verde: This beachfront Italian restaurant is for breakfast, lunch and dinner and serves an array of seafood, pizzas, pastas and other Italian favorites. The Watercourt: The Balinese-themed Watercourt pays tribute to legendary water–palaces of Bali with magnificent fountains and pools. The restaurant serves breakfast and is available for wedding receptions and other private dinner functions. Garden Cafe: Surrounded by cascading waterfalls and lagoons, the cafe serves classic dishes from Asia to Europe for breakfast, lunch and dinner. Nampu: For amazing Japanese cuisine cuisine, head to Nampu which offers a rustic Japanese Izakaya (country inn) setting. Salsa Bar: This stunning rooftop bar offers panoramic views of the surroundings. Relax signature cocktails while enjoying the tropical surroundings. Pesona Lounge: Enjoy a diverse selection of tropical cocktails, coffee and suites. A guitarist duo performs in the evenings. Pool Bar: If you don't want to leave the pool, you don't have to. The Pool Bar serves light meals and refreshing drinks all thoughout the day. Whether you dream of eloping or want a grand destination wedding, the resort has a team of coordinators that can make your wedding wishes come true. Wedding venues include: gardens, poolside, beach, villas and more. Ask about the "Semara Ratih Wedding" wedding package which includes: decorations, romantic ceremony, photography, spa treatments and more. The capital city of Denpasar is a 45-minute drive from the hotel. Sanur is just 15 minutes to the east and Ubud about 30 minutes to the north. Nusa Dua is about one hour to the south. Visit the Bali Mother Temple of Besakih which is made up of 22 temples, Bali Butterfly Park, one of the biggest butterfly parks in Southeast Asia, Ubud Bali Cultural Center and Bali Museum. Rates start at 310 USD per night. The hotel offers deals and packages, including romantic, spa and bed & breakfast. The "Romance Package" includes breakfast, wine and late checkout. The Spa Package includes a breakfast, $100 spa credit and late checkout so that you can relax on your getaway.